Anyone is welcome to attend a Firm Roots Cancer Prayer Support Group. People who join us include those who have a cancer diagnosis, family and friends supporting someone through cancer and oncology staff. People from all different denominations attend and we also welcome people who do not attend church or are unsure about faith, but who would like to receive prayer and encouragement as they go through cancer. The Lancashire Cancer Prayer Support Group started in February 2014 and meets on the first Tuesday evening of the month in St John the Baptist Church Hall, School Lane, Burscough, Lancashire L40 4AE, 6.30pm to 8.00pm. Contact Linda Aspinall for more information - firmroots@stjohns-burscough.org 07598 503689. The Birmingham Cancer Prayer Support Group started in February 2015 and meets on the first Wednesday morning of the month, 10.30am til 12 noon at Sutton Coldfield Baptist Church, Trinity Hill, Sutton Coldfield, West Midlands B72 1TA. Contact Pat Cox for more information - cancerprayer@scbc.org.uk, 0121 355 5088 (Sutton Coldfield Baptist Church). The Chester Cancer Prayer Support Group started in April 2015 & meets monthly on the second Thursday in the month, 12pm til 2pm in the church cafe - Cafe Connect, St Mark’s Church, St Marks Road, Saltney, Chester, Cheshire CH4 8DE. Contact Jan Speirs for more information - Jan.Speirs@firmroots.co.uk, 01244 675372 (St Marks Church). The Maidstone Christian Cancer Support Group started in February 2016 and meets on the first and third Monday afternoon of the month at Linton Road Free Church ME15 0AL. Contact Andrew Parfitt for more information - ccsgmaidstone@gmail.com, 01622 761322. The Huddersfield Cancer Prayer Support Group started in September 2018 and meets monthly on the first Thursday of the month, 6.30pm til 8pm at Kirkheaton Community Centre, Fields Rise, Kirkheaton, Huddersfield, West Yorks HD5 0LZ. Contact Helen Jones for more information Helen.Jones@firmroots.co.uk, 07936 186028. 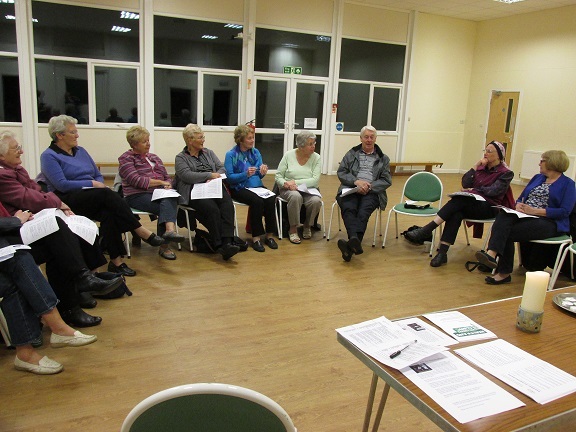 The Conwy Christian Cancer Care group started in February 2019 and meets at Horeb Schoolroom . Rhiw Road . Colwyn Bay . Conwy . LL29 7TL. Contact Owen Morris for meeting dates and times - owen.r.morris@aol.co.uk, 0750 5703110. Tea, coffee, cake and getting to know each other. Introduction/theme for the evening e.g. peace/hope/fear. Bible readings and reflection on the theme. Each group also has a ‘Firm Roots Book of Prayer’ where people write prayers or prayer requests. Some people email prayer requests before the meeting, if they are not able to attend and are having treatment/surgery etc. Sometimes the group listens to a song during the evening, or there may be quiet background music during the time of prayer. Candles can be lit to remember specific families, or to pray for the bereaved. There is the opportunity for people to receive individual prayer (prayer ministry), if they wish. The evening always ends with a group prayer, which is read out loud together. Why come to a Cancer Prayer Support Group? "We come to encourage others in prayer and to be encouraged ourselves." "I enjoy meeting with people that understand what you are going through and the sense that you do not have to explain everything." "Supporters need help too and I enjoy the positive attitude of the group and being comfortable to laugh and cry together." "I’m so glad I found this group – it gives me hope. Although you can call various organisations for support, all you sometimes need is the personal touch and a big hug." "Being ill or caring for someone who is ill, can be very lonely and frightening and it is good to be around others who understand." Part of the Firm Roots vision is to see Cancer Prayer Support Groups (CPSG) setting up around the country. These could be offered in hospitals, churches, community centres, or prayer groups could potentially be linked to other cancer support groups. The meetings do not need to be led by ordained people alone and can easily be run by Christians who have known God’s love and support through their own cancer experience. We are currently linking with churches around the country who are looking into setting up prayer groups. We have devised a pack of resources for leaders of Firm Roots Cancer Prayer Support Groups and the pack includes information from Macmillan about starting and running a support group, guidelines on praying for people affected by cancer, two years of session plans, including leader notes and group sheets. A sample of the pack is available on request if you are thinking about setting up a CPSG. We are also planning a Firm Roots training day/national conference in 2018 so watch this space! If you would like some help to start a Cancer Prayer Support group in your area, please contact Helen Jones on Helen.Jones@firmroots.co.uk or phone 07936 186028.